You will earn 2,620 Reward Points. Earn 1 reward point for every 1 dollar spent. 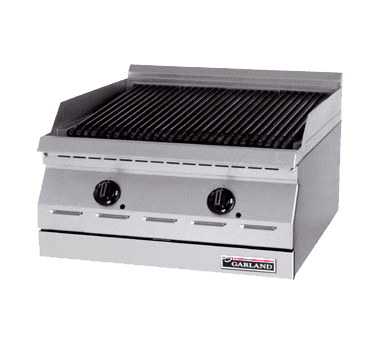 "CE" approved models are equipped with Flame-Failure protection and have suffix "FF"
Gas designer series broilers in four widths; models GD-18RB 18" (460mm) wide GD-24RB 24"(610mm) wide GD-30RB 30" (760mm wide) and GD-36RB 36" (914mm) wide. Designed as free standing or to be banked with other GD series equipment. 24" (610mm) deep x 15" (381mm) high, easy clean design with stainless steel front and sides, cast iron radiants, and optional broiler splatter shield. Hi-Lo valve controlled, piezo spark ignition, natural or propane gas, 45,000, 60,000, 75,000 and 90,000 BTU. "CE" approved models are equipped with Flame-Failure protection and have suffix "FF".